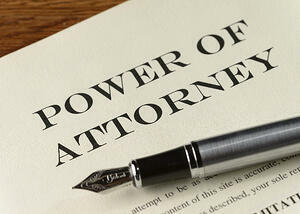 Can an Individual File for Bankruptcy Using A Power of Attorney? A Power of Attorney is a unique legal document that permits a designated party for conducting certain transactions on behalf of an individual. Some of these transactions may relate to insurance, property, banking, participating in legal proceeding, and health. A Power of Attorney can be limited to specific transactions or may be general enough to allow the designated party to conduct any transaction that the individual could have conducted. Over the years, our firm has filed numerous bankruptcy petitions using a Power of Attorney and has successfully litigated this issue. Generally, the majority of bankruptcy courts throughout this country have determined that a power of attorney, with general authority to litigate, includes the power to initiate a bankruptcy filing. Although not in complete agreement, a majority of bankruptcy courts have held that a power of attorney which provides a general authority to litigate includes the power to initiate a bankruptcy proceeding. The Court agrees with the majority of bankruptcy courts and finds that a power of attorney which provides broad authority to litigate includes the authority to commence a bankruptcy case. The power of attorney signed by the debtor, without specifically mentioning bankruptcy, gives her daughter the broad authority to file and prosecute legal proceedings on her behalf. Therefore, the Court finds that the language used in the debtor's power of attorney is specific enough to allow her daughter to sign a bankruptcy petition and to authorize the filing of a bankruptcy proceeding on the debtor's behalf. The Court also finds that an attorney-in-fact may sign a bankruptcy petition on behalf of the debtor without engaging the practice of law. However, when a case is commenced under a power of attorney the attorney-in-fact is required to sign the petition, schedules, and statements in a manner that reflects the representative capacity of the attorney-in-fact. Here, the signature on the petition, schedules, and statements bears the debtor's name, but the documents were actually signed by the debtor's attorney-in-fact. Therefore, the debtor's attorney-in-fact is required to sign an amended petition, statements, and schedules, in her representative capacity as attorney-in-fact for the debtor. In re O'Connor, 2009 WL 1616105, at *2–3 (Bankr. N.D. Ohio Feb. 27, 2009)(internal citations omitted)); United States v. Spurlin, 664 F.3d 954, 959 (5th Cir. 2011)(“We conclude, agreeing with Ballard, that a general power of attorney may be used to file for bankruptcy on another's behalf. General powers of attorney allow someone to manage another person's affairs”); In re Curtis, 262 B.R. 649, 623 (Bankr. D.Vt. 2001)(power of attorney including the authority to litigate sufficient to authorize the filing of a bankruptcy case), In re Hurt, 234 B.R.1, at 3 (Bankr. D.N.H. 1999)(power of attorney granting “broad authority over financial and legal affairs includes the power to commence a bankruptcy”); In re Rauso, 2007 WL 184725, *7 (Bankr.E.D.Pa. Jan.25, 2007)(power of attorney granting “broad authority to institute legal and equitable proceedings” provides authority to file a bankruptcy petition); In re Ballard, 1987 WL 191320, at *1 (Bankr. N.D. Cal. Apr. 30, 1987). Although the majority of bankruptcy courts have permitted a bankruptcy filing with general language to litigate in a federal proceeding, a minority of court have determined that the power of attorney must specifically provide for language that the designated party can file a bankruptcy petition. In re Brown, 163 B.R. 596, 598 (Bankr. N.D. Fla. 1993)(power of attorney must expressly authorize the filing of a bankruptcy.). It is also clear, that the bankruptcy petition must be signed by the power of attorney and indicate their representative capacity. In re Rice, 521 B.R. 405, 408 (Bankr. N.D. Ga. 2014)(“This court agrees with those courts which require that an agent's representative capacity be plainly indicated on the document signed. By signing her husband's name and failing to indicate her representative capacity, Mrs. Rice's execution of the petition initiating this case was nothing but a forgery.”). If the individual is mentally incapacitated and the Power of Attorney does not permit for the filing of a bankruptcy petition, then the Power of Attorney may have other options, including seeking guardianship over the individual in state court. Following appointment, the guardian may have the opportunity to file a bankruptcy petition. If you are a Power of Attorney and are considering bankruptcy for an incompetent individual, please call our firm for a free consultation to discuss your options and whether your Power of Attorney qualifies to file a bankruptcy petition.